Do you love exploring the great outdoors while sitting at the back of three or four wheelers and turning this love of yours into a great vehicle rental business venture? Your target market may include families, outdoor adventurers, contractors or scientists who choose to use the machines to reach remote areas. Thoroughly knowing your area’s off-roading potential helps you jump-start the business. The best spot for renting ATV’s is close to designated off-road areas or back country recreational locations where the machines are allowed. Check with the state or federal agency that manages the area to determine what permits or licenses are required if you operate within the boundaries of the park or national forest. Here’s some helpful information that is perfect for aspiring entrepreneurs who hope to start an ATV tour business. Read this article before you open up shop. This article includes some useful suggestions on starting an ATV tour business. ATV touring has catapulted into the mainstream of the travel and tourism industry. Unlike buses, ATVs give tourists a certain amount of independence, and direct access to the sights and sounds of their destination. Are you thinking of starting an ATV rental business? If you are, there are things you must consider so that return of investment will come sooner. Read on and learn what they are. The lure of riding an ATV is sure great because it gives an exhilarating experience to people. The fun of riding in this kind of vehicle is just plain joy. 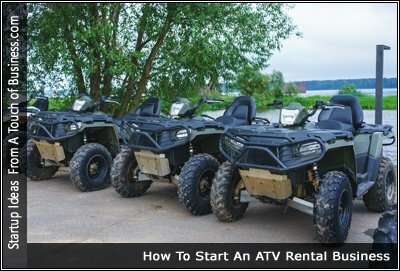 If you see this as a potential money-making business for you, read on and learn what to consider when starting an ATV rental business. When I spoke with a man in Montezuma about how he started his ATV business he told me that five years ago he started the business on an impulse. He had come to Costa Rica for vacation and when he saw that there was an opportunity to build and ATV business here, he decided to capitalize on it.